we are manufacturer and exporter of silver QUAICH in various sizes with options for different handles. Any size or deisgn can be given shape to perfection as per your requirements and needs of buyer. Our product is gauarnteed for 92.5% PURITY OF SILVER. This floral belt buckle is made in sterling silver. Also called Nurses belt buckle. Is a nice gift for nurses on their birthdays, anniversaries or any other memorable event in their life. 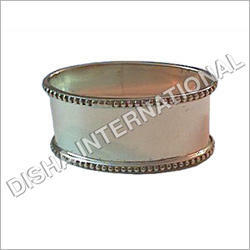 We are one of the major manufacturers and exporters of Silver Beaded Napkin Ring in the market. The offered racks are manufactured using the best quality silver and advance techniques by our skilled professionals. In addition to this, clients can avail these racks from us at the most affordable rates. We are offering customized products.